Profile: Firecracker likes to joke that he was born in a Cybertronic wind tunnel. As the one Autobot most perfectly adapted for defying the forces of friction and air resistance, he's developed a tendency for deliberately putting himself in circumstances that require his talents. This need for speed is a habitual compulsion of his, and it knows virtually no bounds. He's also a control freakperhaps because he knows that any loss of accelerator control in his vehicle mode would mean his certain destruction. In situations where he feels like he's lost his handle on things, Firecracker's temper flares like a raging beryllium bull, and there's very little the Autobots can do to calm him down. 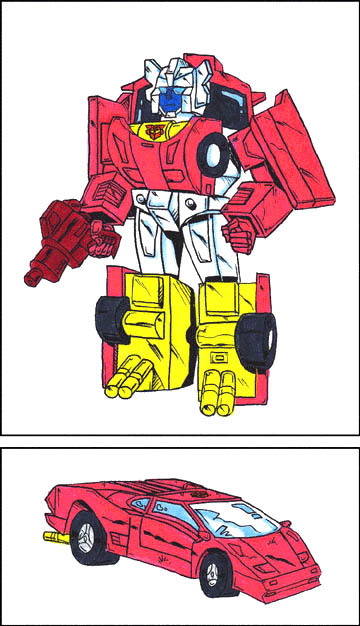 Abilities: Firecracker has the most sophisticated acceleration and deceleration capability of all the Autobots. He is equipped with an internal forcefield deflector that reduces drag resistance to nearly undetectable levels, enabling him to attain his maximum speed of 720 mph in 8.2 seconds from a stationary position. His high-octane ignition turbines are linked directly to his internal coolant levels, automatically compensating for any increase to his engine temperature in the event that he overexerts himself during a race in vehicle form. The enormous vented braking discs that contribute to his design allow him, at top speed, to come to a full stop in 12 seconds flat. In robot mode, Firecracker wields a vibration-sensitive rocket launcher that fires projectiles capable of demolishing a two-story building with one shot. Weaknesses: Firecracker's capability for high speed in vehicle mode puts him at extreme risk. If his elaborate deceleration systems ever failed to provide the necessary braking power, he would continue to accelerate until he burned up like a meteor.